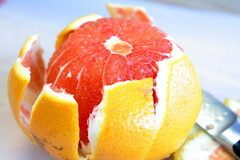 Today, we prepared two simple dishes that are mainstays of their cuisines. 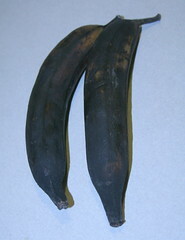 The first was pan-roasted plantain, a staple in Latin America and the Carribean. The secret of this dish is to wait for the plantain’s skin to turn black as show by the left picture. Black = Sweet. 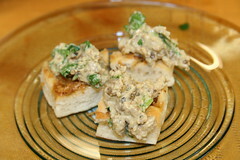 The second was baba ghanoush, a roasted eggplant dip that is very popular in the Middle East and the Mediterranean. Today, we continued to take advantage of locally-grown greens by preparing them in three ways. First, we prepared collard greens in an Indonesian-inspired coconut milk sauce. 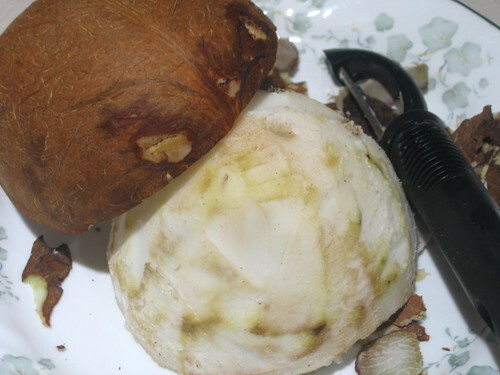 We prepared the coconut milk by extracting juices from a coconut. Second, we prepared red chards with ground beef in a guisado, a Philippine-style sautÃ©. Finally, we prepared Chinese broccoli with soy sauce. 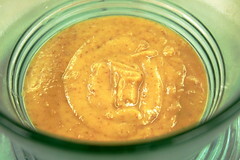 Today, we prepared Masala Dal, a protein-rich legume dish that is a classic in Indian cuisine. We boiled yellow split peas in water, purÃ©ed, and then seasoned it with salt. While the peas were cooking, we prepared oil seasoned with mustard seeds, browned onions, and a bit of cayenne pepper. Here is the Masala Dal recipe. We served the dish with pita bread toasted with ghee. As an accompaniment, we prepared a Tomato and Yoghurt Salad with chopped tomatoes mixed with yoghurt, sour cream, green pepper, and a mustard seed-flavored oil. 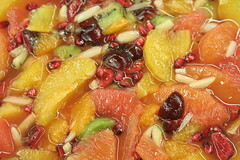 Here is the Tomato and Yogurt Salad recipe. Today, we started our our culinary adventure producing curry powder from whole spices. 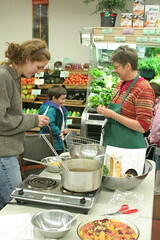 We continued by using the curry to flavor green beans and chick pea (garbanzo) flour. Freshly grated coconut and cloves sweetened the dish. We culminated the adventure by explaining how to separate the coconut meat from its shell. Today, we made garam masala spice mixture, starting with whole spices. The process took some time to complete but it was very satifying to make a fragrant blend that is much better than the pre-mixed variety. 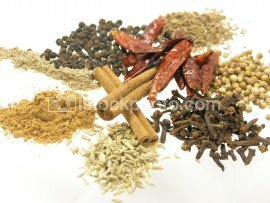 We produced enough garam masala for several dishes. As a start, we made stuffed cauliflower, a specialty from the Marahashtra state of India. This state may not be familiar but it’s capital, Mumbai (aka Bombay) certainly is. The stuffing consisted of a garlic paste with spices. The cauliflower was steamed first, then combined with a tomato sauce that included garam masala and other spices. The dish was well-received by our Co-op clientele. To balance the rich flavors of the stuffed cauliflower dish, we also prepared a cool dish called Cucumber and Yoghurt Salad, also known as a Cucumber Raita.